I trust everyone enjoyed one of the last weekends of summer..I am so not ready to see these nice days fade away into fall. Those of you back east are starting to get those beautiful autumn leaves (I am so envious). I hope to see some of them when I'm off to New York and New Jersey this week. I received so many emails from you readers out there trying to help out with the "empty text dilemma" of last week. A million thanks to each of you who sent me a solution - you are all brilliant! Many of you wrote to me suggesting Quick Select (QSELECT). This great command makes it easy to filter out all the text objects (I will go into more detail below). One reader, Rob Nykvist, sent me an AutoLISP routine that he uses to get rid of empty text strings. I'm hoping he's okay with my sharing this nice routine with all of you! It appears to be written by Julia Ball and then updated by Rob (I always like to give proper credit). Using this routine is super simple. Download blanktxt.lsp file to a directory you can get to easily. 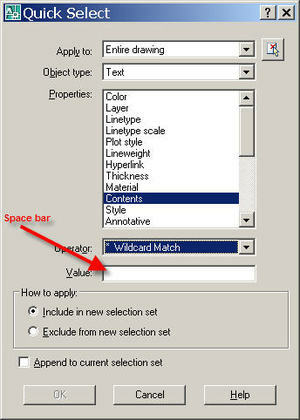 Use the APPLOAD command in AutoCAD to load the command into the current drawing session. You then run the lisp routine inside of parenthesis like this: (BLANKTXT) - this is done at the command prompt. Note: I noticed that it couldn't find my empty MTEXT objects but it did a great job at deleting any text strings created from the DTEXT or TEXT commands. So you will select Text (Object type), Contents (Properties), *Wildcard Match (Operator) and a space under Value. This same process works for your MTEXT objects as well. In fact this was just about the only way I could figure out how to delete empty MTEXT objects. Incidentally - if you aren't familiar with the way QSELECT works you will now have a selection set of empty text objects (they will be highlighted) - you can then easily erase them. A great big thank you to everyone who wrote me about these pesky empty text objects...Jeff Ng (who went to great lengths to lay all of the QSELECT options out for me), Darin Schreier, Rene van den Brink (who also recommended using the good old FILTER command) along with many others of you. Thank you so much! Well - that was a long post! I need to go pack for my trip back East tomorrow!